What Is the Accounting Formula? 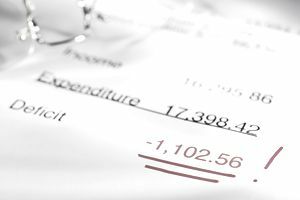 The accounting formula serves as the foundation of double-entry bookkeeping. Also called the accounting equation or balance sheet equation, this formula represents the relationship between the assets, liabilities, and owners' equity of a business. The equation shows that the value of a company's assets always equals the sum of its liabilities and owners' equity. Once you understand the accounting formula basics, you'll have a better grasp of the contents of a balance sheet. The accounting formula also helps explain the relationship between a company's financial statements. This equation must balance, because everything the firm owns (assets) has been purchased with something, either some form of debt (liability) or owners' capital. The category of assets refers to items like cash, inventory, or accounts receivable. Examples of liabilities include bank loans, credit accounts, or accounts payable. Owners' equity is the investment or capital the owners have in the firm. Business profits retained from prior periods also qualify as capital or equity. If you know any two of the three components of the accounting equation, you can calculate the third component. If you look at a balance sheet, you can also see that a balance sheet represents a fleshed-out form of the accounting equation with account-level detail. Thus, the asset account for Office Equipment was increased by $500 and the liability account for the company's credit card was increased by $500. Regardless of the type of transaction, when it's recorded properly, the accounting equation stays in balance. In practical, real-world use, the accounting equation contains several components in each section, reflecting the detail on a company's balance sheet. For example, total assets includes current assets such as cash, certificates of deposit, inventory and works in progress, and any prepaid accounts. Long-term assets includes equipment, machinery, buildings, and other assets that won't be liquidated within the next year. Total liabilities consists of current liabilities, such as payments due in one year or less, long-term debt due more than 12 months out, and other long-term liabilities such as pension obligations. Owners' equity consists of different forms of equity, such as capital surplus, common stock, retained earnings, and treasury stock. To figure out Amazon's total assets, use the accounting equation and add up the liabilities ($103.6 billion) and the owners' equity ($27.71 billion) = $131.31 billion in total assets. The expanded accounting equation shows the relationship between the income statement and the balance sheet. The retained earnings component of owners' equity in the accounting equation can be broken down into two parts: revenue and expenses. So far, the accounting equation has focused on the components of the balance sheet. Breaking the owners' equity part of the accounting equation into revenue and expenses shows the relationship between the balance sheet and the income statement since revenue and expenses make up the key components of the firm's income statement. Revenues, also called sales revenues, result from the business providing its product or service to customers. Expenses are the costs the business incurs to provide the product or service to its customers. The relationship between revenues and expenses is simple. If revenues are greater than expenses, then the business generates a profit. If revenues are less than expenses, then the business sustains a loss. The owner or owners of the company can also withdraw a salary or equity from the business. If the company is incorporated, then that salary may be in the form of dividends paid by the corporation. However, if the company is small and a sole proprietorship, partnership, or limited liability company, then the owner or owners will take a draw from the business as their salaries. where revenues increase owners' equity, expenses decrease owners' equity and draws or dividends decrease owners' equity. On a company balance sheet, instead of seeing revenue and expenses, you'll see the net profit or loss number under the name "retained earnings." If your accounting equation doesn't balance, your financial reports will lose their integrity and you won't be able to keep track of your financial transactions. The accounting equation acts as a checks-and-balances system to make sure that all relevant accounts have received entries, and each transaction has been recorded in full, in the proper dollar amounts for the given transaction.